When I ran across this cupcake recipe during my daily blog reading, I knew immediately that I had to make them for our friend's birthday. He loves the mint/chocolate combination and I knew these would hit the spot. Besides, I already had devil's food cupcakes in the freezer left over from these cupcakes. 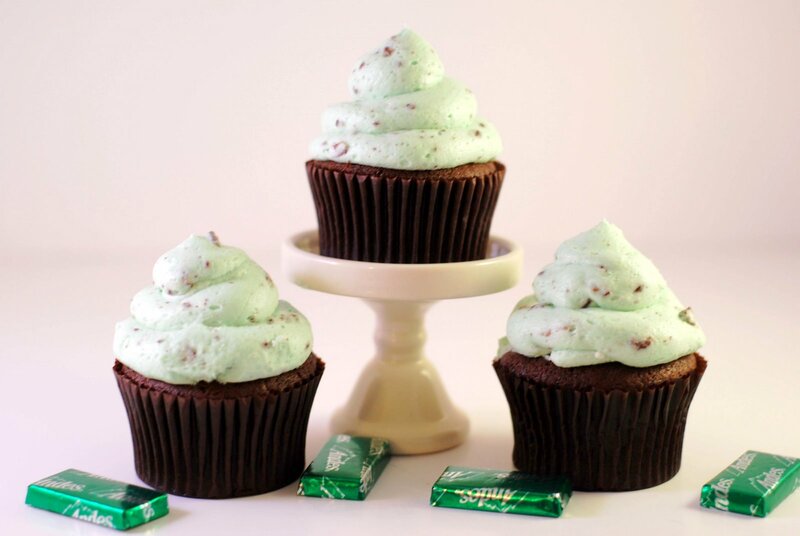 The crushed Andes mints add plenty of mint flavor to the buttercream, so I didn't feel the need to add mint extract. I added a couple of drops of green food dye to make the mint color that is reminiscent of mint chocolate chip ice cream, but for some reason, it doesn't really show up in my photo. My food photography skills are definitely not up to par with my kitchen skills, but I'm slowly learning. For the chocolate cupcakes, I used this recipe. Yum! I love mint and chocolate together. These look too cute! This looks like a great recipe! Reminds me a little bit of my father's "Irish brownies" recipe. Say, seeing how you like to play with food, are you ever interested in doing a product review? I represent a food company in my day job, and think you could enjoy trying out their products. Just drop me a line at sarah@lemkeanderson.com if you'd like to learn more. I saw that lovely pile of frosting and knew life would never be the same. Making this week!